Wonder what we are looking for when probing your gums and why it is necessary? A dental probe is a tiny ruler, which measures in millimeters and is used to determine the health of the gums and bone that lies underneath. The gums act like a sleeve around the tooth, creating a small natural space or crevice and when diseased, it’s referred to as a “pocket”. Usually this space is 1-3mm in a healthy mouth and allows the probe to fit comfortably. When plaque and tartar start to accumulate along the gums they initiate an inflammatory reaction, which causes an increase in the depth of the pocket to an unhealthy measurement of 4mm or above. If inflammation persists, it begins to cause breakdown of the bone underneath the gums which supports the teeth. 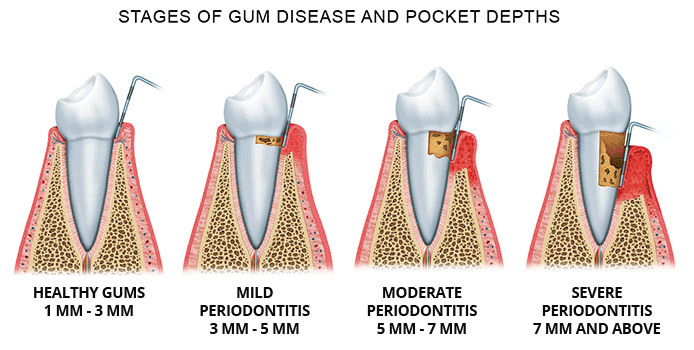 So when we probe an inflamed pocket where bone loss has occurred, a large unhealthy pocket will be present indicating periodontal disease. Other indicators such as color, consistency and bleeding also help in the diagnosis of gum disease along with the evaluation of radiographs. Radiographs and probing are necessary in combination to access the bone level and determine if your gums are healthy. In conclusion, when a patient’s gums turn from pink to red, go from firm to spongy, we are alerted that a disease process is starting. The dental probe is an adjunctive measure used to diagnose periodontal breakdown, so we can immediately implement preventative measures in a timely fashion to prevent tooth loss.